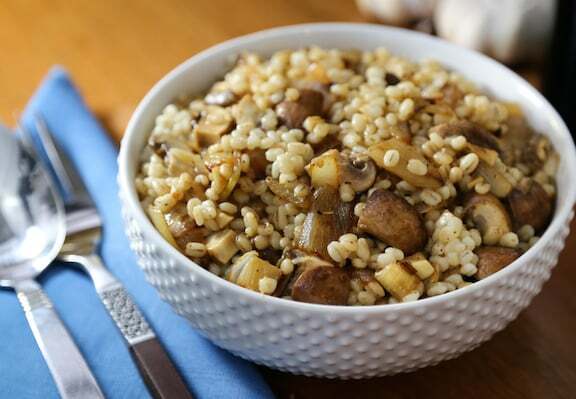 Mushrooms and barley are a match made in culinary heaven. Best known for their pairing in comforting soups, they make an equally good duo in this hearty side dish, embellished with lots of onion and fresh dill. Brown mushrooms yield a richer flavor than white, so give them a try. Photos by Evan Atlas. Combine the broth or water with the barley in a medium saucepan. Cover and simmer gently until the water is absorbed, about 35 to 40 minutes. Taste, and if you’d like a more tender texture, add another 1/2 cup of water and simmer until absorbed. Meanwhile, heat the oil in a wide skillet. Add the onions and sauté until translucent. Add the garlic and continue to sauté slowly over low heat until the onions are lightly and evenly browned. Add the mushrooms and about 1/4 cup of water. Cover and cook over medium heat until the mushrooms are wilted, about 8 minutes. Add the cooked barley to the skillet and stir together with the onion and mushroom mixture. Stir in the dill, and season with salt and pepper. Continue to cook for 2 to 3 minutes longer, then serve. Here are more healthy whole grain recipes. Looks like a delicious recipe. have to try it. Loved this recipe. Although since I am not a vegetarian (yet) I added a few slices of crumpled applewood smoked and peppered thick cut bacon and it came out sensationally. 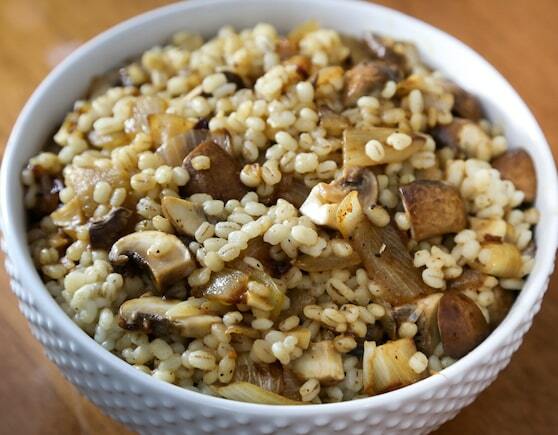 I only boiled the barley for 20 mins, I prefer it al dente and added the remaining barley water to the skillet of mushrooms and onions instead of a separate reserve. Dynamite! where can i find barley? Nilsa, you can find barley at most any supermarket, where you’ll find bags near where dried peas and lentils and such are shelved. Or in any natural foods store, where you can buy it in bulk.